The NHL and the NHLPA have ratified the new collective bargaining agreement, and the 48-game (shortened) regular season begins Saturday. I’m trembling in anticipation. I cannot wait to see Sid Crosby, Geno Malkin, James Neal, Kris Letang, Brooks Orpik, Chris Kunitz, Tyler Kennedy, Craig Adams, and all the other Penguins back on the ice. The season opener is in Philly against the F%$ers, and it should be interesting. The teams have had very short training camps. But these days, hockey players spend the off season staying in shape and even improving their physical conditioning, and some of the players have been playing in other leagues, so it shouldn’t take long for everyone to get up to speed. To put the icing on the cake, Center Ice is free for the rest of the month, so there will be lots of games to watch. Watching hockey means knitting, but the knitting has to be mindless because hockey is a very fast sport. You can easily miss something great in the blink of an eye. Of course, with today’s technology, you can just back up and watch it over. You don’t even have to wait for an instant replay. 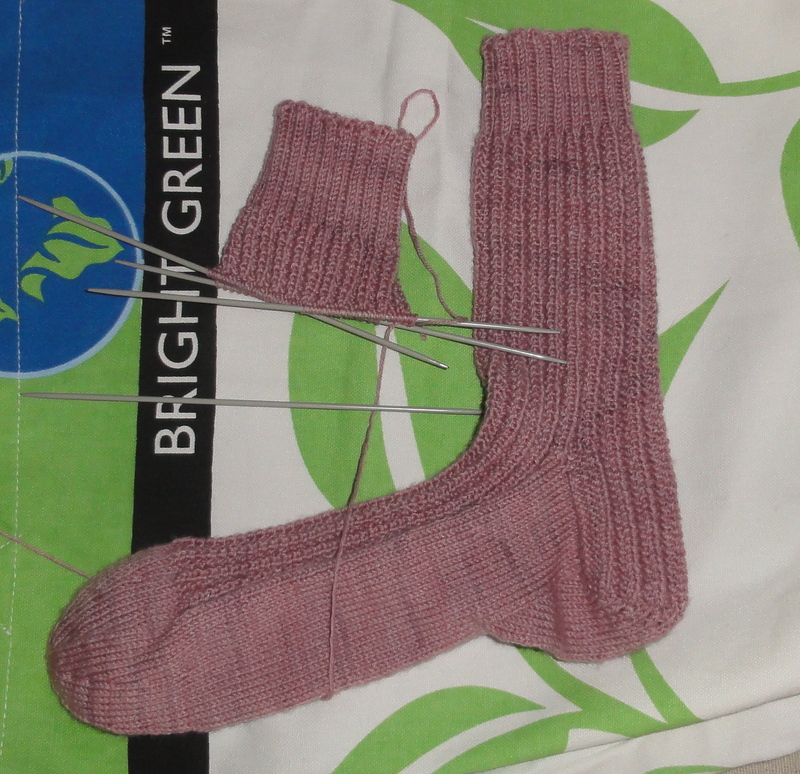 But I like to have mindless knitting in hand for hockey games, so I have been busy casting on more socks. Not all socks are mindless knitting, but my favorite, go-to stitch patterns for socks are all pretty mindless, so socks are a good choice for knitting while watching sports on TV. Since the casting on, either cuff down or toe up, is one of the few parts of knitting a sock that requires some concentration and close attention, I like to cast on ahead of time. Having multiple socks OTN means that if I get to a place that requires my attention, like picking up gusset stitches, I can simply put the sock down and pick up another to work on. Then I can pick up the gusset stitches or whatever during the intermission if I want to continue working on that particular sock. Anyway, here are the socks I have OTN just in time for the opening of the NHL season, and what better day to share them with you than WIP Wednesday! The second Reversible Rib sock is well under way. 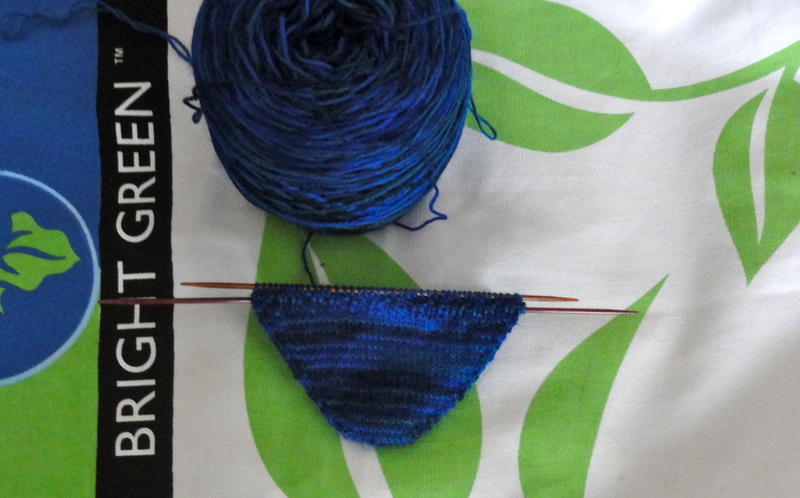 The second Revisible Rib sock wants to grow up to be just like her big sister. And I have started a sock with the softest sock yarn ever, Pagewood Farms Alyeska, which is 80% wool, 10 % Nylon, and, wait for it…10% cashmere. It’s just 2 x 2 ribbing right now, but I will be working the leg in double garter stitch, which is just two rounds of 2 x 2 and two rounds of plain knit, mindless knitting that does wonders with handpainted yarn. And then there is this sock that is destined for the DH. The yarn is Shaeffer Anne in a lovely blue and green color way that I simply am incapable of capturing in a photograph. The blues are like sapphires, the greens like emeralds. Anne comes in a skein that weighs a hefty 4 oz/120g and contains a generous 560 yards, so it’s perfect for making a pair of man-sized socks. Even so, I’m not taking any chances of coming up short on the second sock. I’m knitting these socks toe-up. This entry was posted in Knitting, Socks, Uncategorized and tagged cuff-down socks, hand knitted socks, knitting and hockey, Pittsburgh Penguins, toe-up socks. Bookmark the permalink. ← A Frog In My Future? Hooray for hockey! Hooray for Sock knitting! All three of these patterns are tempting me to cast-on! I love your socks!! 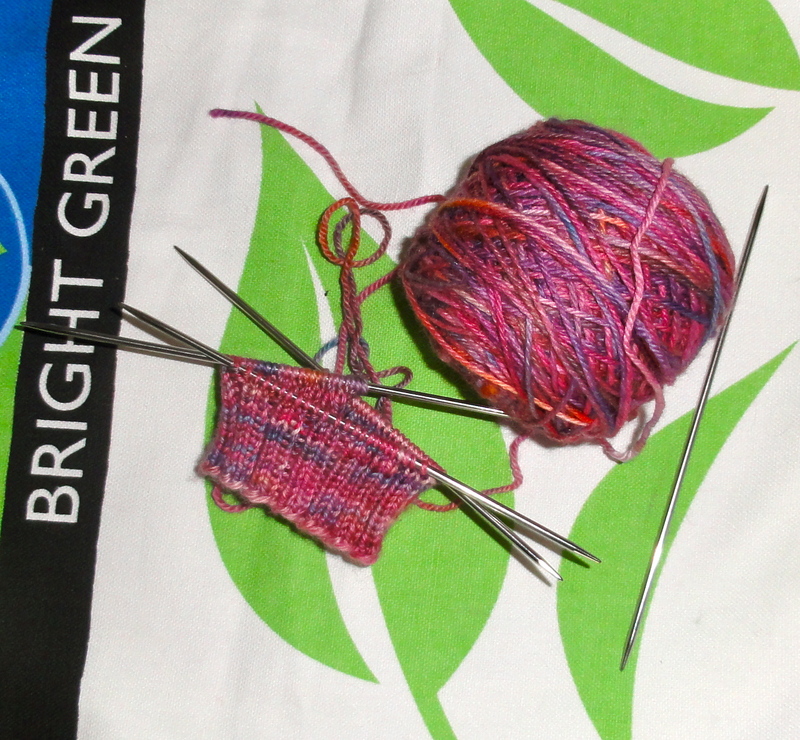 I am still so new at knitting socks that they are never mindless – I have to knit on something like a blanket or scarf. Q – Love the socks! Go Rangers!